So last weekend I had the privilege of having my Mom, Dad and Sister in town for my bachelorette party and couple's shower (Dad obviously didn't go to the bachelorette party). <K> and I received so many amazing gifts to help improve our home, our kitchen and our BBQ so I was instantly inspired to cook. To make matters worse, my mom, sister and I went to the William Sonoma store right around the corner from my house and spent an hour looking around at all the gadgets. My sister, who's also engaged, mentioned that she was interested in getting an old fashioned pasta maker, something I also had been looking for when we made our registry. I have two memories of my childhood when my mom sat at the kitchen table and rolled out homemade noodles. I remember thinking, at the time it had to be a party since the the flour seemed to fill the air like little confetti bits. Ever since then I've always wanted to learn how to make homemade pasta and this weekend my mom taught us! My sister and I each both an old fashioned pasta maker for less than $30 (it was on sale). 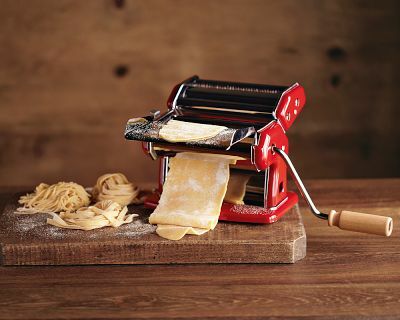 We took them home and in the mists of all the shower gifts we all put on our aprons and got to work mixing flour and eggs with our fingers then carefully rolling it through to create the perfect lasagna, linguine, angel-hair and spaghetti noodles. I can't wait to try making these cost-effective noodles again. What a great way to put a homemade touch on your meals. Here are some pictures of the noodle-making adventure we all shared. The final product was pretty good, a little starchy but I think that will get better with time. I think I could also add a little dried herbs to the flour and egg batter to give a little "fancy" touch.